What else would you expect when food is considered as the soul of the nation? Welcome to the ultimate foodie destination, Malaysia! A diverse and multi-racial country rich with culture and heritage, it’s nearly impossible to list down all the good food in one article. Without a doubt, Malaysians really love their food. So much so that we even have a 24-hour food culture where you can never go hungry as there will always be someplace to eat at any time of the day. This list is far from exhaustive as there are still A LOT MORE to mention. But, here are some of the best savoury dishes anyone who sets foot in the country should not miss. Crispy on the outside, soft on the inside. This flatbread is good to eat at any time of the day – for breakfast, after clubbing, or when trying to save money for the next big trip. Best eaten hot straight from the pan, this unleavened flatbread is typically served with chutney, curry, or masala gravy. Simple yet filling. You can have it plain, or add cheese, butter, garlic, or a combination of them all, this puffy flatbread is traditionally cooked in clay oven and goes exceptionally well with chicken tandoori and mint dip on the side. An Indian version of crepe, it is simple yet filling, served with three types of dipping sauce including dhal, curry, and chilli or coconut chutney. Don’t be surprised to find at least five different variety of fried rice options in a typical Malay restaurant, sometimes they even have close to twenty options! Nasi Goreng Biasa (cooked with chilli and soy sauce), Nasi Goreng Kampung (with anchovies), Nasi Goreng Seafood (with prawns and squid), Nasi Goreng Cendawan (with mushrooms), Nasi Goreng Paprik (with chicken or seafood in sweet chilli sauce) are amongst the staple options. Roasted or steamed chicken? Take your pick – both are equally delicious. Served with rice, chicken soup, chilli sambal, and soy sauce. This Peninsula Malaysia East Coast specialty consists of rice cooked in coconut milk and fenugreek seed, giving an inviting texture and colours. Served with fish, prawns, or chicken curry with a side of vegetable pickles and hard-boiled egg. Yes, the rice is blue! Courtesy of the butterfly pea flower petals used in preparing the rice. The rice is mixed with a set of vegetables including bean sprouts, long beans, cabbage, cucumber, and banana flower. A dash of budu (fermented seafood sauce that is a Kelantanese specialty) and sambal belacan (shrimp paste), with grated fish on top adding a little bit of kick. Try the vegetarian version or with grilled meat and fish crackers. Translated as mixed rice, it is an easy lunch option for everybody. Chicken, beef, seafood, or plain vegetarian? Depending on the stall/restaurant, the meal tray options may include different types of cooking like masak lemak cili api (spicy coconut milk and tumeric-based gravy) or rendang (herb-rich paste), or kangkung belacan (spinach with prawn paste). Mix and match per your liking. On a diet? No problem – just ask for ‘nasi separuh’, which means half portion of rice. Rich with spices and herbs, a plate of briyani rice with mutton or chicken with a side of acar (pickled vegetables) is all you need to cap off a good day. Thin slices of tender beef cooked with chilli, tomato, and oyster sauce, served with a side of steamed vegetables and simple curry gravy. Be warned, food coma is common after a good plate of Nasi Kandar. While there is nothing particularly extraordinary about the dish (it is basically rice with curry, meat or seafood, and vegetables), that should not stop you from trying it out. Don’t forget the papadoms on the side! Mix together rice, chicken, soy sauce, Chinese kale, and a choice of either salted fish or mushrooms in a claypot, and wait as it slowly cooks on the stove. Yummy! Sizzling hot and delicious to boot! Watch as the crispy yee mee slowly harmonises into the flavourful thick sauce with chicken, mushrooms, egg, and vegetables on the side. A dish best eaten on a cold day or night, to bring out the heat in you! Goes very well with a side of plain bread. Meat on sticks! Chunks of juicy chicken or beef (some places even do mutton or deer) are squished on a stick, grilled to smoky perfection, and served with nasi himpit (compressed rice), onions and cucumber, and dipped in thick peanut sauce. A Malaysian salad, like no other on the planet. This mix of beancurd, cucumber, potato, bean sprouts, turnip, with added seafood such as prawn fritters, fried crab or octopus, and drenched in spicy peanut sauce is must-try especially when in the northern state of Penang! A texture so pretty and tastes so good, it’s baffling how easy it actually is to make these lace pancakes. Normally served with savoury chicken curry or sweet durian gravy, it can be eaten for breakfast or as an afternoon snack. Originating from Indonesia’s Minangkabau tribe, rendang is a spicy and thick cooking style that can be found everywhere but is especially popular during festive Hari Raya (Eid) celebrations. Eaten with plain white rice or lemang (glutinous rice), the explosion the mouth is real! Stink beans may not have a very good reputation when it comes to after-meal breath, but who cares when the dish is so delicious! This cooking style can be done to almost any meat or seafood, but the most popular one is with prawns. Spicy chili marinade on a variety of fish including stingray, sea bass, grouper, pomfret, mackerel, and catfish, grilled until reddish brown with a whiff of appetite-inducing aroma. It must take a really good dish to sway Malaysians from their love of rice (and noodles), hence the oyster omelette. Flavours from the oyster blend in nicely with the eggs, and dipped in chilli sauce. A Western-Eastern fusion that came about during the British occupation of Malaya. Back then, the British employed local Chinese as cooks, who learned to infuse local flavour into Western fare. The result? A wholesome crispy battered chicken strip with French fries, drenched in sweet and sour gravy made from tomato sauce, chili sauce, and Worcestershire sauce. Blanched yellow thick noodles drenched in savoury gravy made from prawn broth. Fried noodles with a slightly wet texture, mixed with beancurd and beansprouts. A squeeze of lime on top adds more zest to the meal. A perennial local favourite, this dish of flat rice noodles oozes gastronomical flavours from the mix of soy sauce, shrimp paste, cockles, and prawns. Slippery rice noodles in sour gravy made from fish, Laksa Asam is associated with the northern states of Penang and Kedah, but can be found almost anywhere in the country. Other varieties of laksa include Laksam Kelantan (coconut milk-based with thick noodles), Laksa Sarawak (chicken curry-based instead of fish), and Laksa Johor (with spaghetti pasta instead of the rice noodles). The sweetness from the prawns makes this simple yellow noodles in curry gravy a taste to remember! This pork stew dish originated from Klang, a district in Selangor, and is filled with a burst of flavours from various herbs used. Thin yellow noodles drenched in soy sauce, served with kalian vegetable, shredded chicken, crackly wantons, as well as clear soup on the side. The original wanton is non-halal, made with char siu (barbequed pork). Barbequed pork that is originally a Cantonese recipe. 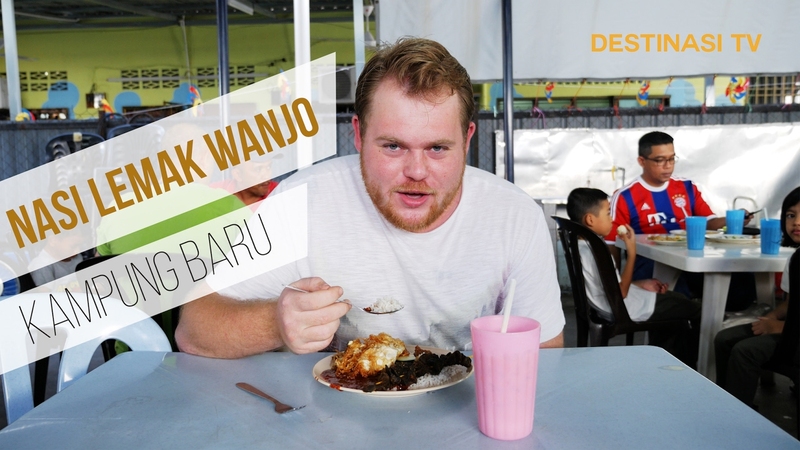 A must try when in Sarawak! Springy thin noodles, blanched in hot water with herbs and soy sauce, served with pork slices on top. The national all-day breakfast. Seriously, who would have thought that rice cooked in coconut milk, anchovies sambal, fried anchovies and peanuts, eggs, and cucumber would blend in harmoniously? And then there are varieties such as the simple and cheap nasi lemak bungkus or the fancier version with fried chicken, squid sambal, or beef rendang. A dish uniquely complex yet so satisfyingly good. Last edited by KucingKelabu; 23-09-18, 11:48 PM. Apa korang punya favaorites ?? ..